The release of Band Aid's 1984 single "Do They Know It's Christmas?" raised a new consciousness of the devastating famine in Ethiopia in which several million Ethiopians died after years of drought and the unimaginable horror and suffering the Ethiopian people were enduring. The success of the single inspired an American response single, "We Are The World" by USA For Africa and soon, artists from other countries and music communities began releasing what has become known as The Benefit Single. In which artists, producers, recording studios, labels, distributors and retail outlets would donate their talent, time and resources in bringing these singles to market with no compensation and 100% of the proceeds from the single would go to the charities in which they were intended. After seeing a similar benefit single released by local artists in another city, Seattle producer and songwriter David Perry created Seattle's own benefit single for Ethiopia. This single, "Give Just A Little" was a sort of who's who of Seattle's local music talent and media personalities of that time. Including Annie Rose & The Thrillers, The Eagertones, The Dynette Set, Rail, The Cowboys, Chuck Conlon, Eric Tingstad, Michael Tomlinson, Mondo Vita and Red Dress. Radio and TV personalities Wayne Cody and Nick Walker of KIRO-TV, KUBE Radio's Truck Rogers, KHIT Radio's Maureen Matthews, KPLZ's Jeff King, KNBQ's R.P McMurphy and local legend Merrilee Rush (who sang the original version of the pop classic "Angel of The Morning"). As well as The Neville Brothers and many others. The single benefitted the USA For Africa aid charity as well as local food bank Northwest Harvest. Reminding us that hunger exists right around the corner as well as halfway around the world. This single (like many others) got some brief media attention, but it was also becoming apparent the market was becoming saturated with benefit singles and while local sales were good, they were eclipsed by the "We Are The World" single which inspired them. However, as we are approaching the 30th anniversary of "We Are The World" (and it still seems like yesterday! ), these singles still stand as an irrefutable testament to the fact that were it not for the music communities, Ethiopia would have starved while the politicians just talked. And every little bit helped. 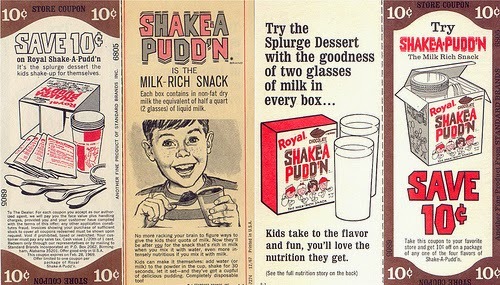 Royal Shake-A-Pudd'n was an instant pudding mix from the late 1960s. It came with four cups, four spoons, four lids and four packets of pudding mix. You just added water. 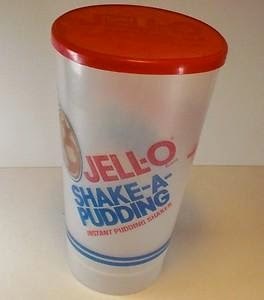 The line was later manufactured by Jell-O in the early-mid '1970s (as the more grammar-correct Shake-A-Pudding.) 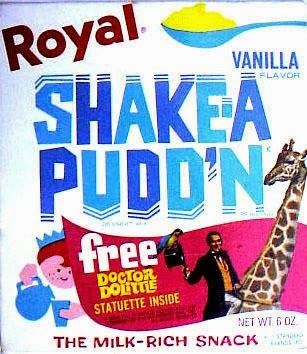 before being discontinued. Ipso was an Irish made breath mint that was popular in the UK in the 1970s and '80s and was briefly sold in the US. They came in Peppermint, Orange, Lime and Raspberry flavours. Spearmint and Cinnamon replaced Lime and Raspberry in the US. They were most famous for their Lego-like boxes, which you could collect and stack. However, they had a very special use for drug users, who used them as stash boxes, leading to many American schools banning them. But overall, they never sold well in America and disappeared from US shelves by 1981. They lasted until the late 1980s in the UK. They never had a large advertising presence in the US, but in the UK, they were noted for this classic TV ad. They lurk around shopping centers and box stores....Shady people, usually young men (but sometimes young women) in vans and SUVs. They look at you and lick their chops as they pull over to you and make you a deal you just can't refuse; a brand new set of surround sound speakers and subwoofer for $200. 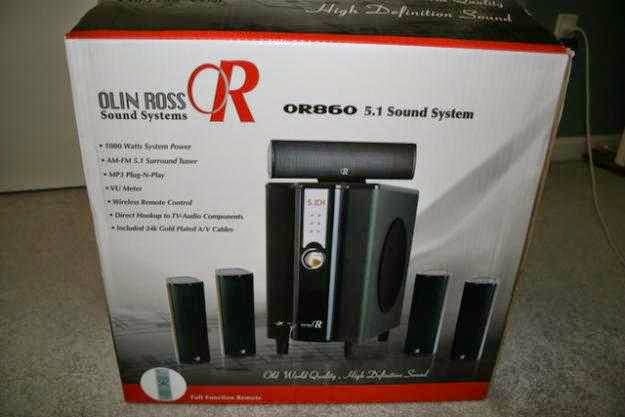 Who is Olin Ross? you ask? He/She then whips out a glossy brochure and even reviews in an audiophile magazine. And you begin to salivate at the superlative filled testimonials and reviews by audio experts who were left breathless by the performance of this thing. So....You give them $200 and even an extra $20 for beer money because they were so cool. You race home and begin to set this thing up. And it's right there you find out you've been had. You got speakers, but really crummy and tinny sounding ones. The subwoofer is particleboard slapped together with glue. The volume control has static and overall, it's garbage. The magazine with the glowing reviews? Fake. The brochure? Fake. The company web address on the brochure? Fake too. And you wouldn't have bought this at all if you knew what it really was. You my friend, have fallen victim to the White Van Speaker Scam, aka "The Speaker Guys"
It's not a new scam, it goes way back into the early '70s. And it isn't just speakers or even exclusively white vans the cons use. But any fishy sounding person who sells any kind of stuff from the back of a van or SUV in the parking lot of a Walmart, Home Depot or a supermarket. I have heard many stories from people who got screwed already so when I was first approached by these cons in the '80s, I was able to fend them off (but not easily, they just don't know the meaning of give up.) But in recent years, the scam has really been on the rise. And it's not just in America. You can find these scammers all over the world. Protecting yourself is easy; Buy A/V equipment only from reputable dealers and not from vans. Some Weird DAT I Have: Is It YOURS? Sometime in early 2002, a friend of mine gave me a box of loose cassettes. They were mostly mixtapes by random people with no labels. I played a few of them out of curiosity. I still like doing that sometimes whenever I run across an old used blank cassette. I can still do that because I still have not just a cassette deck, but a full blown audio component system. Hey, I was "hipster" before they even had a name for them. 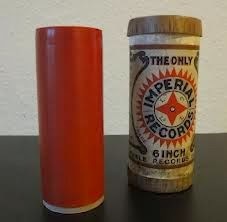 Some were stuff recorded off the radio, others were full albums. Babylon And On from Squeeze and Tango In The Night from Fleetwood Mac was on one of them. Another cassette had The Division Bell from Pink Floyd recorded on one side, The Spice Girls on the other. But nothing in my life prepared me for one mixtape that was the craziest one I have ever heard in my life. Side One started out with "Somewhere" Barbara Streisand. Genteel, I know. 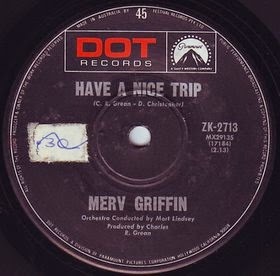 But I let it play as I was writing an article on vintage record label designs for a friend's web site. I figured it was probably a Babs tape. Or a mix of something of the "Lite Adult Contemporary" ilk. I suddenly spit out my sip of Jim Beam & 7-Up all over my keyboard when I heard the next song - a GG Allin song. WTF? (And if you don't know who or what a GG Allin is, here. But let's say he's just not the kind of guy they play on "K-Lite".) And FYI, that wasn't the actual song on the tape. Just the only one in his repertoire clean enough to play on a fairly PG-13 blog. You can look up YouTube for the rest. But make sure grandma is out of the room. 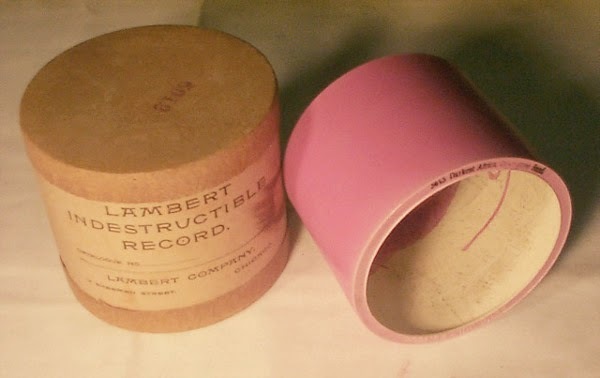 The tape continued with The Dazz Band, Waylon Jennings, unknown ragtime music, Motley Crue, Ed Ames, The Buzzcocks, Rita Coolidge, Yngwie Malmsteen, Sylvester, Mercyful Fate, Gordon Lightfoot, Millie Jackson, The Mentors, Parliament, Dan Fogelberg, Scritti Politti and so forth. I had to put the whiskey away and finish the article the next day (with a more stable soundtrack.) My brain just couldn't process the mental whiplash of everything. And I am NOT making any of that up. I still have that cassette. But to the point of the matter. 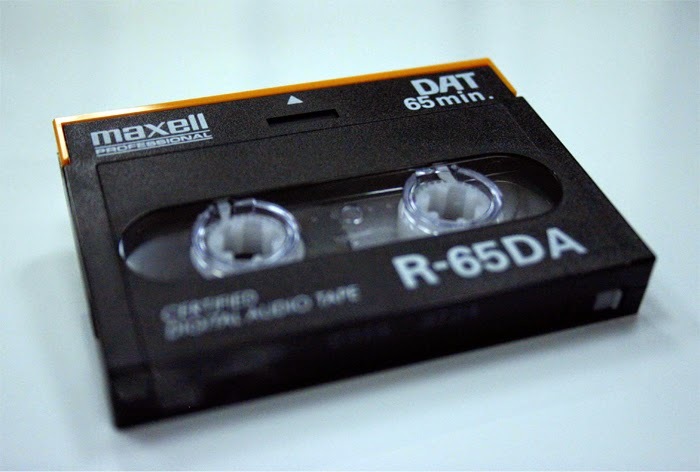 DATs were a short lived digital format in the early '90s that was popular with amateur/developing musicians. Mostly for mastering demos, as this tape is. The problem is I can't tell you what it really is because I don't have a DAT player. The group (or solo project) is called Innervision and I'm not sure what it is musically, but from the song titles, it would appear to be some kind of progressive rock act. It's an audio mystery in fading pencil writing on the J-card. And most importantly, (which the scan did NOT read) was "MASTER". This means whoever did this recording must've put some serious dedication into this. All I want is for this DAT to come back to it's rightful owner. It's been here long enough. Maybe I should just scoop up an old DAT machine somewhere and hear what it sounds like. But I know musicians and they tend to be picky about things. So out of courtesy and respect, I will hold on to it. Someone knows somebody. And a chance look through Google. That sort of thing. I don't know if it's a priceless, one of a kind demo. But I have it. Let me know, wherever you are. In the early 1930s, in the worst throes of The Great Depression, industry everywhere suffered. But perhaps not nearly as bad as the recording industry. In the previous decade, record sales were at an all time peak. But then came the stock market crash of 1929 and suddenly, people were having to make choices not on what they want, but what they need. For just survival. And making it worse for the record sales was radio. There was really no point in buying the latest hit songs with what little money you had when you could hear them ad nauseum on the radio. And most people didn't. 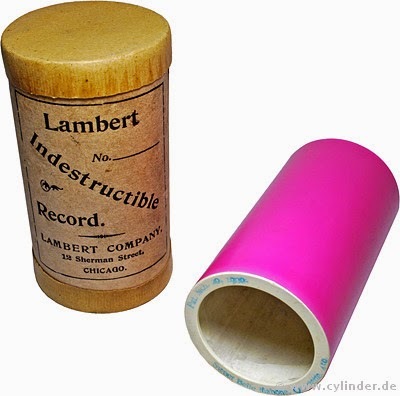 However this meant the recording industry had to come up with brand new gimmicks. Daring ones. 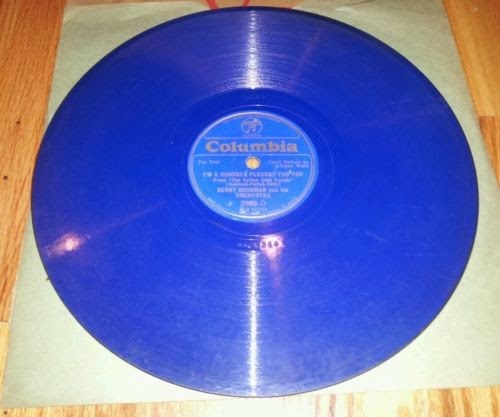 The Columbia Royal Blue Record wasn't the first "coloured vinyl" (actually, shellac.) 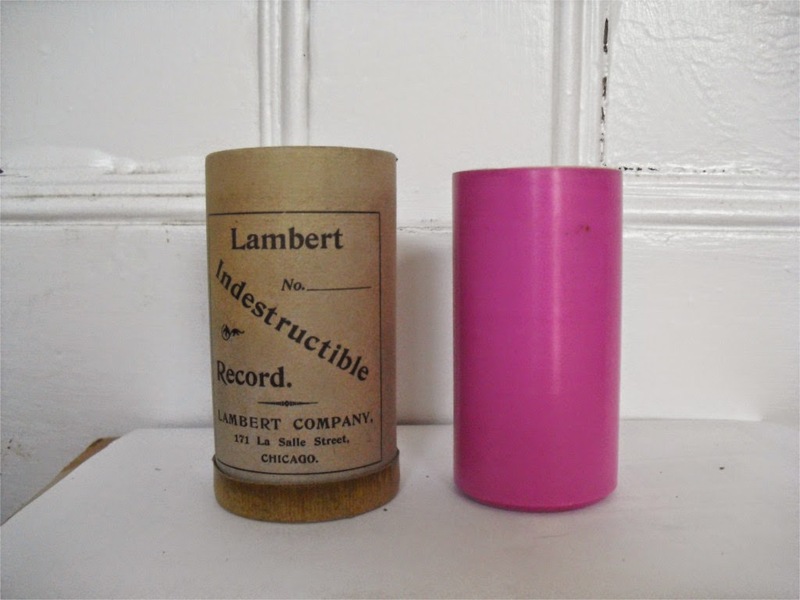 That goes way back to cylinder records. 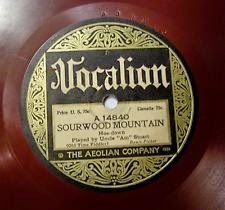 And early Vocalion Records were reddish brown. 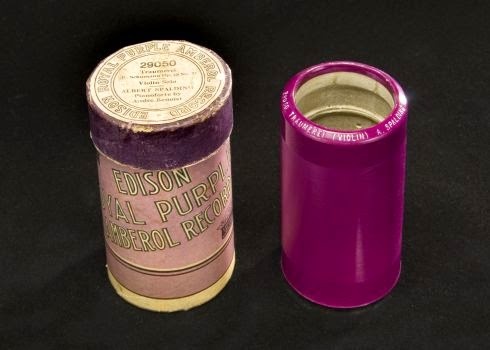 But shellac colours were extremely rare on disc records. They were virtually all black. And if you were a Columbia phonograph dealer struggling to stay alive in late 1932 (In those days, your phonograph dealer was usually also your record store. ), you had a serious problem. No one is buying the records. And the radio stations were killing you. 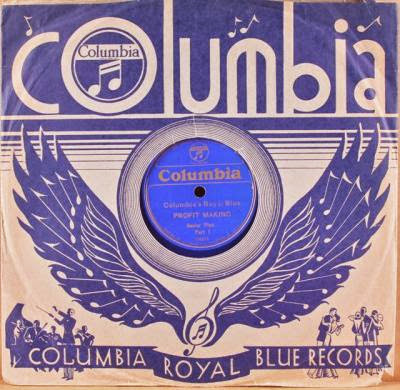 So Columbia unveiled their Royal Blue records. 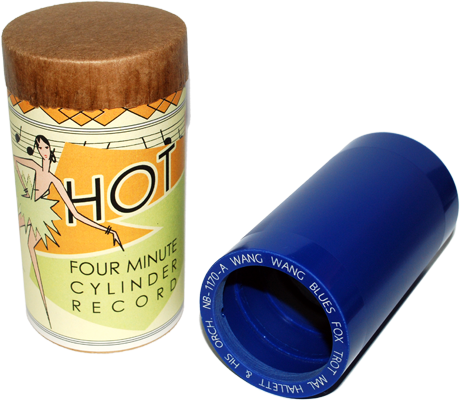 With this record, which described the basic terms for the dealer. They sounded amazingly good for a 78 and if you play them today with a 3.5mil diamond stylus and a magnetic cartridge, there is VERY little surface noise. The Royal Blue line however only lasted a year. 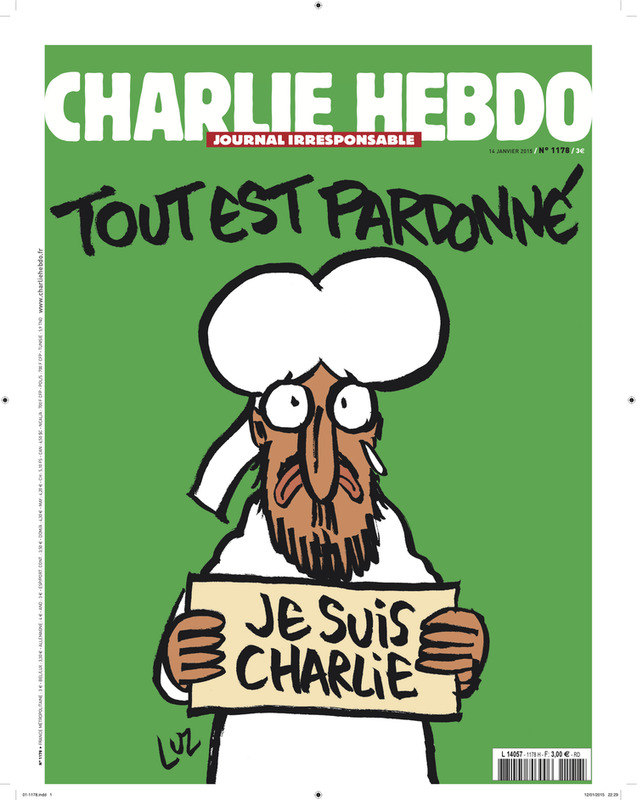 The January 14, 2015 issue of Charlie Hebdo. Headline: "All is Forgiven". It has been nearly a week since the massacre at the Paris offices of Charlie Hebdo, a French satirical weekly newspaper. And words still fail me. This was a direct attack not just on a little French weekly. It was an attack on all of us who cherish freedom of speech. The artists, writers, journalists, reporters and bloggers of the world, be they on paper or online. And their readers. No matter where we are in the world. And a painful reminder that even in America, there are hateful forces right here that are willing to silence those who they do not agree with through deadly force. The surviving staff of Charlie Hebdo in spite of enduring the most horrific tragedy imaginable, have chosen to carry on. Because you cannot give in to evil no matter what the threat may be. The path of freedom has always been a long, painful and bloody one. But stopping is not an option. Like some broadcasting ghost story, it gets told again and again. But like many urban legends, there is a grain of truth underneath the embellishment. 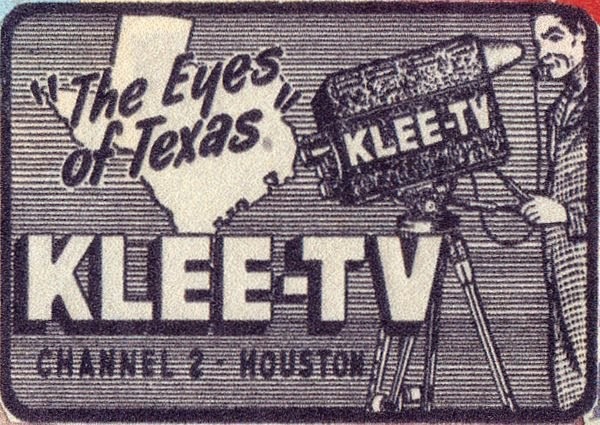 In 1958, Reader's Digest magazine published an article on how one mysterious afternoon in 1953, a signal showing the station ID card of KLEE-TV, Houston, TX appeared on TV sets throughout the UK - three years after KLEE-TV was sold and their call letters had changed to KPRC-TV. Now here's the grain of truth: It's not uncommon for local over the air radio/TV signals to reach crazy distances under the right atmospheric conditions. It's a phenomena that happens every night on the AM radio band. But more rarely on FM and TV. But they still happen there. Overseas reception of FM and TV signals is the rarest of all of what is known as "DXing", an actual hobby amongst radio/TV fans who surf over our ever increasingly noisy airwaves, trying to find those far off stations from hundreds, or even thousands of miles away on locally empty frequencies that can make brief appearances from a few seconds to even an hour or more on FM radio and TV. There are several online web sites and chat boards for DXers. When you did find a far off station, the receiver of the signal would track down the address of the station and send them a confirmation of what they heard and at what time. To which the station engineer would send back something called a QSL card, which was like a postcard (which it was) with the station logo on them. Engineers used to look forward to getting these letters, as it was a testament to his/her engineering skills. They don't send out QSL cards anymore (the last one I got was in 1982.) and there are far fewer broadcast engineers today than there were in those days. In fact, the last convention of broadcast engineers I saw could have been mistaken for an AARP gathering with the number of grey, white and bald heads I saw there. And when they're gone, I'm not sure who is going to take their place. Not many young people seem to be taking up the profession. First, all broadcast signals fade away into the ether eventually. They cannot reflect back from a different time. If they could, the airwaves would be a far bigger mess today than they already are, considering all that has been transmitted over the last 100 years on every frequency around the world. Third, the transmission carrier frequencies of US and UK TV were also different. "As it turned out, in a particularly clever marketing effort, a would-be British entrepreneur had sent a form letter to all U.S. TV stations making the claim that their station’s signal had recently been viewed in the UK. For proof, the sender included what appeared to be a photo of that station’s test pattern on a TV screen. Hoping to peddle a TV set he claimed could receive broadcasts from extreme distances, the sender had been working from an old list that did not reflect the Houston station’s change of hands. The Bell & Howell Language Master was a language teaching system used by language and speech therapy instructors in the 1960s and '70s. It used 3 1/2" x 9" inch cards with a strip of magnetic tape that ran near the bottom of the card with two tracks that ran for 3 seconds. One for the instructor, the other for the student. It allowed switching between tracks to compare instructor/student pronunciation. *Guitar effects pedal (as shown in the video) not included.